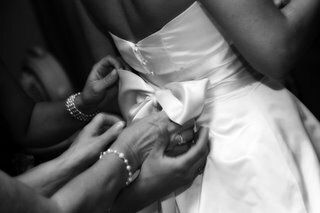 Even though I've been through the wedding process myself I'm constantly amazed by all that goes into getting a bride ready for the weddding day. I think it's great because it's fun to be a girl, but sometimes I think it's a little much. I like this photo because there are four different hands (four different people) trying to make this the perfect bow. They tied and untied the bow at least a dozen times frantically trying to get it right. I'm not saying that they're wrong for wanting it to be the most beautiful bow ever, I just think it's very interesting. As long as these things don't ruin your day and take away from what's really important it seems mostly harmless. Any thoughts, girls? I think there's something really comical about this pic. and sweet. and it kind of stresses me out, too. :) "The photo elicits number of conflicting emotions." Personally, I enjoyed being a princess for a day. Just a day. I think my wedding was not really fussy in any way. Not that day, anyway. I probably over-planned in advance, but on the day of, I didn't worry about anything! People that loved me and Bryan were making sure things went smoothly, and I just trusted that. Actually, I found out after the honeymoon that the florist (Mrs. Krueger from TCA) and I had both assumed the other had arranged to have the candles on the alter lit. The mothers were all ready to walk down the aisle and the Perkins lady noticed it. No problem - they just grabbed two ushers and had them do it. Plus, I didn't have any bows to worry about! I think having that many people all touching me would have stressed me out. I was only engaged for 9.5 weeks myself! I did spend that whole time planning (summer between finishing school and teaching -- no job), but it was still harder to overplan with such little time. The photo does capture that wonderful experience of being a princess for a day, which was very fun, even for this non-girly girl! kristin! A woman after my own heart!! Roxana beats us all, though. EIGHT WEEKS, BABY. I guess I could've let her tell you that. Sorry, Roxy. Wow, and I thought 5 months was pushing it! Yea for short engagements and long marriages! Okay so I'm not married not am I planning on getting married anytime soon, however I love simplicity. A guy I know who recently got married said that on his honeymoon his wife was still worrying about the wedding. Seems like sometimes when much fuss is made the actual marriage gets lost in the wedding. Some people have a tendency to forget that there is a life after the big day. To me there is something sweet about just doing it...just getting married, no planning (okay very little planning), no fuss, no perfect bows...just your closest friends and family. I just want to echo the praise for simple weddings, but that's just because I don't enjoy planning elaborate events. I enjoy going to them, but not planning them. I just hate to see brides all stressed out on the day that they should be focusing on their family and their marriage. As long as the true meaning of the day doesn't get lost I think elaborate weddings can be a lot of fun, too. I love hearing about people's weddings. I never knew that weddings could be so unique. Even the one's that stick to the very traditional wedding ideas are still very different from each other. And, no problem sweatpea. You beat me to telling about my short engagement b/c I've been a little crazy this week. Getting ready for my Texas trip!! !